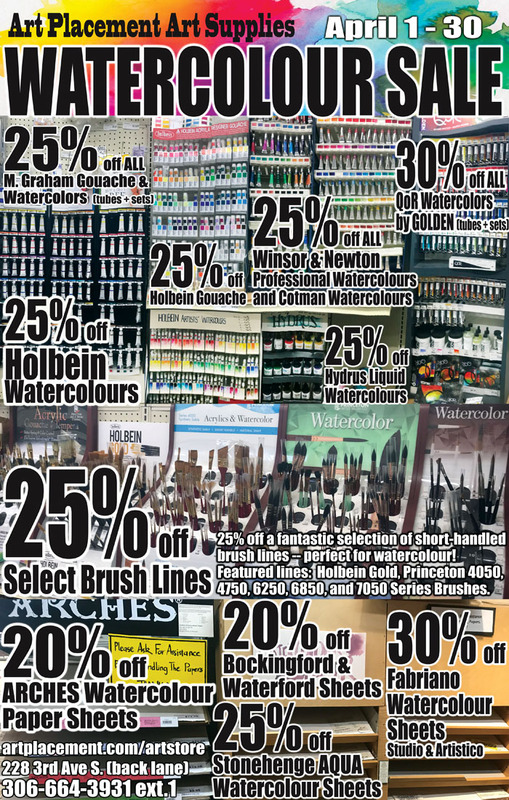 For the month of April, Art Placement is having a gigantic Watercolour Sale just in time for Spring! Great savings on our entire selection of watercolour and gouache paints, as well as select brush lines perfectly suited for watercolour and other wet media, and watercolour paper sheets from a selection of our top-selling brands! Click each product listing for more information including available colours and regular prices. FYI ... M. Graham also has a fantastic Buy 3 Get 1 FREE promo on right now, while supply lasts. The promotion applies to watercolour and gouache! One more reason to stock up! Click here for more information about the M. Graham FREE tube promotion. For the month of April we've selected a half dozen of our most popular short-handled brush lines that are well suited to watercolour painting. Click each product listing for more information including available sizes and regular prices. A great selection of watercolour paper sheets by top quality brands. Click each listing for more information including available paper weights and regular prices. *Remember, Sale Discounts apply to "Regular-Priced Items", which does not include: Clearance-priced items or already discounted items. Sale discounts may not be combined with any other offer or discount, including student discounts, education discounts, membership discounts, and coupons.